School run is a big deal. This morning, I was getting things done from one thing to another, packing my daughter’s bento, doing dishes, putting my makeup on while drinking cappuccino in the bathroom, putting breakfast on the table for my daughter, eating my breakfast standing up, and so on and on, so that we can go out the door in order to make it to her school on time. Her bento had already been prepared on the kitchen counter, but I just didn’t have time to take a picture of it. My iPhone was within my daughter’s reach, so I asked her to take a picture of her bento for me. She is well aware of my routine to keep the record of her daily bento, so she was very cooperative. She grabbed my iPhone and placed it in front of my face to unlock it, and took this beautiful image. I always take her bento photos from straight above and never thought of changing the angle. I didn’t look at the photo right away, but when I did, it took me by surprise as the image gave me a totally different impression, with somehow different lighting and ambience from mine. It perhaps looked more… sophisticated. For the past three years, I’ve made her bento so many times and took a few photos each time. But I have never taken anything like what my daughter took today. Maybe it’s because I was more focused on being consistent each day, and unfortunately failed to see things from various perspectives. With my daughter’s graduation approaching in four days, I won’t have so much chance to practice my photography skills on her kindergarten bento. Still, it feels as if my daughter has taught me an important life lesson, right before her three year kindergarten life is about to complete. Nikudon, pork on rice, is one of the most popular recipes in my blog. It is my mum’s recipe and was passed on to me and my sister before we “married out of the family”. I’m planning to pass it on to my little girl too, once she becomes old enough to be able to handle knives and gas stove. Incidentally on the same day, my parents came all the way to Tokyo from their home in the countryside, in order to buy their youngest granddaughter a so-called “Randoseru”, a chunky backpack used by the most of elementary school children here in Japan. I don’t know when it started, but it is kind of a modern tradition for grandparents to buy a Randoseru for their grandchildren. Our daughter was no exception, and her eventful visit to the Randoseru shop was carried out with her proud grandparents. Additionally and coincidentally, we found out that the word Randoseru is derived from the Dutch word “ransel” (backpack). My Dutch husband got pleasantly surprised that his roots, hence our daughter’s too, is also part of her exciting milestone happening away home home. Despite the distances, our daughter is surrounded by the traces of her roots, whether it’s the food we eat, the words we use, or the custom we follow. Today’s bento: Hamburger steak, Tomato omelet, Simmered carrot, Boiled broccoli, Shirasu (baby sardine) rice, Apple for dessert. I love my daughter’s kindergarten. It is a great school inside out, with kind and highly competent teachers, thoughtful educational philosophy focusing on Japanese culture and seasonality, and it even comes with the beautiful garden with a lot of green and soil on the ground instead of concrete (very rare for Central Tokyo). Apparently the bento is also part of their education, so that the kids would spend their important first few years of their lives, always eating healthy home-cooked meals prepared with love. What makes it difficult to do so, I came to realise, is that some fellow mothers are totally against working mothers as if to say working is a vice. Some mums voiced that “work” cannot be an excuse to miss school commitment, that there would be no special treatment, because kindergarten in general is not for people who wish to work. In good old Japan we had a common understanding that women should protect the household and spend time with their children. Poor kids if mothers have to work. This is slowly changing but is still followed by the great part of the society. With my semi-international background I always have a slight sense of guilt for not working full-time, but now I have another layer in my guilt for working at all. Work, or not work, it surely isn’t an easy place for a person like me, and this, reflects the modern but undeveloped Japanese cultural state in my opinion. Yet, I still love my daughter’s kindergarten. I can’t think of a better place for her to be despite the struggle. A part of me wants to make a difference and fight it, while the Japanese part in me just wants to conform or escape. I go back to my daily bento making, daydreaming that one day, some miracle happens to change people’s mindset for the better. A few days ago, I mentioned about the bright colours I tend to use in my daughter’s bento, which I naturally inherited from my mum. I kept thinking why my mum’s bento involved so many vivid colours, especially considering her strong preference on subtle, understated hues when it comes to her clothing (which I also naturally inherited). Thinking back, I’ve never seen her wearing bright red, yellow or green that we both use in our bento’s. Then I remembered about my conversation with my mum while back, when I was still living at my parents’ place, maybe over a cup of green tea after dinner sitting in Kotatsu*. She told me the story of her bento, reminiscing her childhood memory. 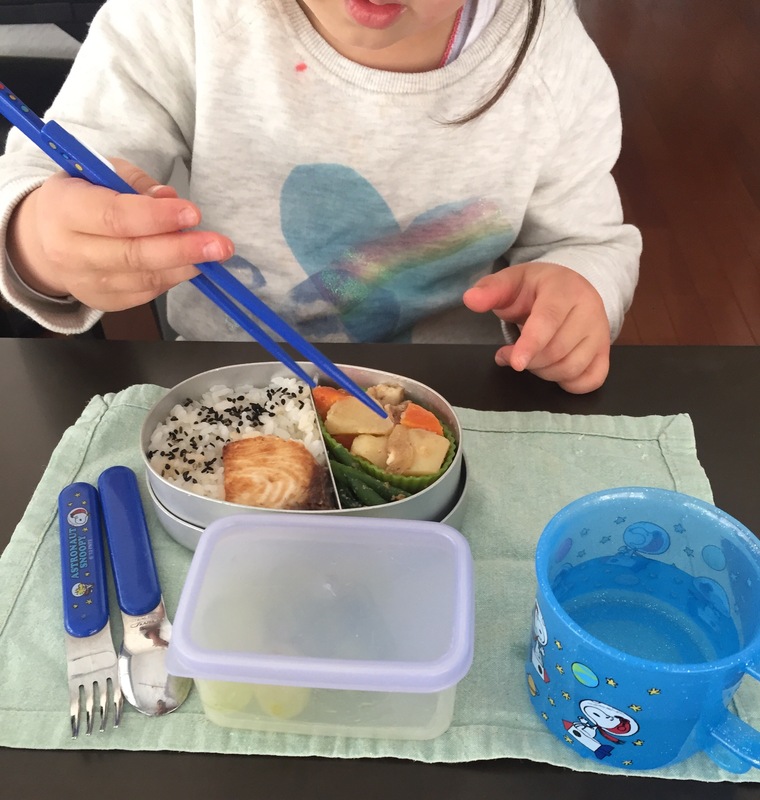 She said, growing up, she was always embarrassed with her bento her mother (my grandmother) made for her. During lunch time at school, she always hid the contents of her bento, covering them with the lid of her bento box, so her friends would not see what she was eating. 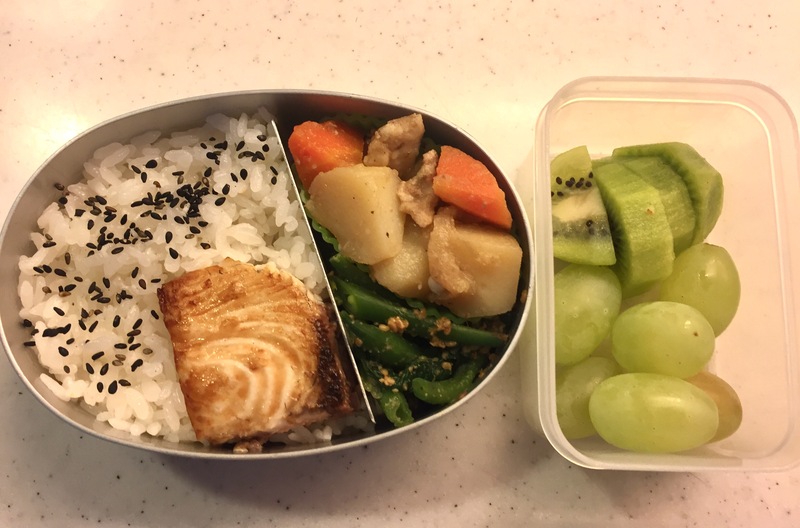 She said her bento was always filled with only very basic ingredients, usually just rice with an umeboshi (pickled plum), pickled veggies and nori seaweed dipped in soy sauce. Sometimes, maybe omelet if their chickens lay some eggs in the morning. Her memory of bento was colourless and somber, despite the fact it wasn’t her intention to put her mother down. It was not so long after the war, so there was limited amount of food supply. They lived in the mountains, and most of the time they depended on their own rice and vegetables they grew in the fields. Moreover, her mother had six children to take care of, on top of working in their rice and vegetable fields and silk farm. Simply put, she did not have luxury of making colourful bento. This seem to have significantly influenced my mum on how she prepared bento for her daughters (my sister & I). She wanted to make visually cheerful bento with vibrant colour palette, so that we didn’t have to go through what she had gone through, and she could give us different experience surrounding what’s inside this tiny box . I remember being always proud of my mum’s bento. I never had a slightest thought of hiding it from my friends. It was quite opposite for me, I always wanted to boast how pretty my bento looked. All these years I never thought about what was behind my mum’s bento. And now, more than ever, I sincerely appreciate my mum for her beautiful bento and embrace all the amazing history that comes with it. Is it only me, or maybe anyone who grew up in the same/similar culture as mine, who feel a slight sense of guilt for cooking something too quick and easy? As a good cook in the Japanese society, you are supposed to (or trained to) devote a great deal of time in the kitchen, to make elaborate dishes. In fact, when we visit my parents’ place, my mum hardly ever sits down with us. She spends most of her time cooking in her kitchen, focusing on serving freshly made dishes one after the other, right from the stove. And she does it with great pleasure. She is very proud of it. I know this is quite the reverse of the modern thinking, and I’m not saying at all that this is how things should be. I hate it, to be forced into the framework of becoming a stereotypical ideal woman, and try hard to push the pressure away always. But on the other hand, this sense of guilt always comes with it. No matter how much I am exposed to the feminism movement, I just cannot change the way I instinctively feel. It is ingrained in my bones, having grown up in the society with high expectations for girls to become a good mum/wife/woman. The society expects it, and your fellow female peers expect it to a certain extent, still in the 21st century. Well, it takes about three minutes to make this yakitori-don if you already have your rice ready. I bought pre-cut chicken thigh (guilt), don’t even have to marinate it (another guilt), stir-fry it and quickly season at the end. Voila, it’s done (within three minutes). I just boiled egg rather than make omelet (guilt), packed it with unseasoned vegetables (guilt). On top of this, I packed frozen apple mousse and mashed sweet potato from the freezer for dessert (see, I am now officially guilty). In between our stay at my husband’s mother’s place in the south of the Netherlands, the three of us took a short trip to Paris for our New Year’s holiday to visit our friends & relatives. We took Thalys, the express train service that runs through Germany, the Netherlands, Belgium and France. Two and a half hours after we left Aachen, a small German city bordering the Dutch city where my mother-in-law lives, we safely arrived at busy Gare de Nord. This time we took a nice Airbnb in an area called Wagram, not too far from Champs-Élysées. It was our first time staying at an Airbnb, and in spite of some reservations we had about the apartment, it was a good choice with great location and ample space for the three of us. On the New Year’s eve, my best friend and her partner invited us to their lovely home for a special dinner. As is always the case in Paris, we started a pre-celebration at 7:00PM and opened a champagne, munching on foie gras and smoked salmon, which seems to be THE things to eat on the New Year’s eve in France. For dinner, Chef F made this delicious chicken filet with foie gras sauce. And the mashed potato… mmm I can still taste this creamy, sweet mash only a French person can make… I’m pretty sure he used generous amount of butter, but maybe it’s better not to find out exactly how much… The sautéed mushroom was nutty and hearty, which was a perfect combination with the chicken and mash. Chef F served the same dish sans the foie gras sauce for their son and our daughter, on a small red kids table. Our daughter absolutely loved it, especially the mash. At the age of five she already knows the divinity of the French cooking. By the time we finished the dinner, the four of us finished two bottles of champagne and a magnum red bottle. Embarrassingly enough, I fell asleep before the countdown began. I managed to wake up when they started counting 10, but could hardly open my eyes and collapsed on their cozy sofa hugging their cute little doggy (she was so soft and warm). At 1:00AM we decided to call the night, and we took an Uber home. On the New Year’s Day, without fail, our daughter jumped on to our bed at 8 o’clock. Dragging ourselves out of bed, we took a hot shower, got dressed and went out. We found out that Centre Pompidou would be open so headed that way. As soon as we got out of the nearest Metro station to the museum, it started pouring, and of course our daughter jumped in to a large puddle. Lucky us… As such we went to a crêperie close by, most likely one of the worst tourist traps you could find in the centre of Paris… We had the crêpe as our early lunch, as we were still quite full from the evening before. Later that evening, Chef F cleverly cooked us some simple pasta to give our stomach some rest. On our last evening in Paris, to return the favour to our host, I cooked some Japanese meal with local ingredients. I loved shopping in a local supermarket and get inspired by all the unfamiliar ingredients. I could easily live in Paris and create locally adopted Japanese dishes… well, in my dreams. For the meal this time though, I stuck with the basics and made ginger pork and hamburg steak with Tokyo rice (that’s how my daughter calls the Japanese sticky rice). I realised, if I have soy sauce at hand, I can improvise many Japanese dishes even without (the very important) dashi broth. Of course it wouldn’t be perfect, but close enough. I used white wine where I needed to use Japanese sake, and honey and/or sugar for mirin. The result? Empty plates at the end of the meal. Grocery shopping at a local supermarket. Nice trolly for little kids. Cooking at their kitchen made me feel at ease. All of a sudden Paris became less overpowering, as if something has planted a seed somewhere deep in my mind that one day we could possibly start our life here. Well, that would certainly be added to my bucket list. After the emergency call from our daughter’s teacher due to some allergic reaction from whatever she had eaten for breakfast (as I wrote on my post yesterday), I rushed into her school to pick her up in the morning, not too long after my husband brought her there on his way to work. As a result, the bento I had made for her in early morning was still in her backpack, untouched. We went to the doctor, got her medicine, and came home in time for lunch. Our daughter was hungry despite her rashes, so I suggested her to eat the bento. 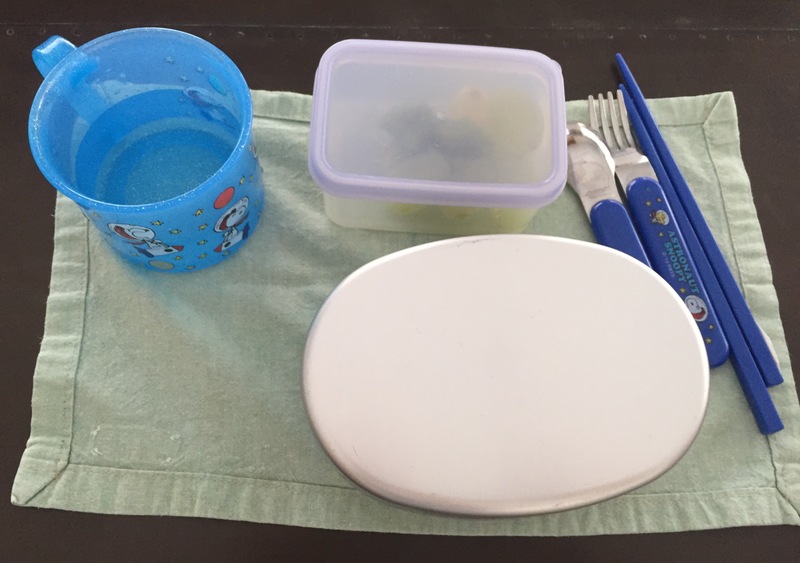 As soon as she heard me say so, she took her bento box out of her backpack along with other items, almost in an auto-pilot mode, and placed them nicely on the dining table. Doesn’t it look cute? Apparently this is what they’ve been trained to do at school on their own. It’s really nice and endearing to see her do it at home, too.